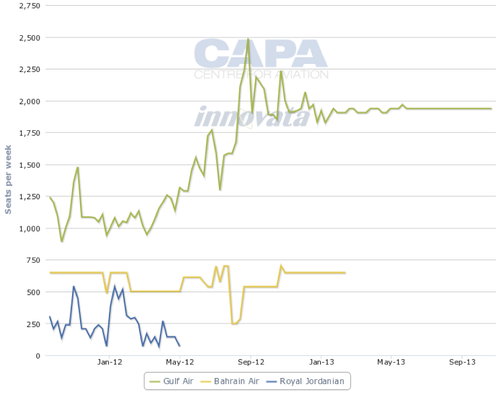 After heavy losses in 2011, Royal Jordanian has reversed its fortunes and managed to scrape a narrow profit in FY2012. The carrier has been buoyed by the result, even in a difficult year marred by continued unrest in neighbouring Syria and economic uncertainty in Europe, one of its largest markets. Even so, the indicators are that the carrier can continue its positive momentum in 2013. By cutting marginal and loss making routes and substituting codeshares, services can be continued, while reducing losses. But, as the carrier receives 787s starting next year, new routes in Africa and the US are in Royal Jordanian's sights. The carrier suffered a net loss of JOD57.9 million (USD81.7 million) in 2011, its worst loss in more than a decade. During the year, Royal Jordanian suffered heavily due to the regional unrest in the Middle East, especially in neighbouring Syria and an associated drop in tourism activity. The carrier lost more than 125,000 European passengers due to the Arab Spring unrest, and was forced to cancel flights into a number of its most lucrative destinations in Bahrain, Libya, Syria, and Egypt. 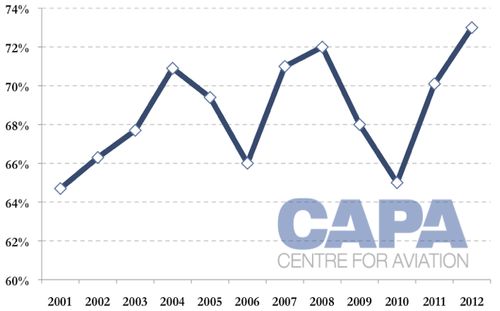 To sustain passenger traffic – which actually grew 7% in 2011 – the carrier discounted deeply for European destinations, although the Gulf region and Asia-Pacific region revenues increased during the year. 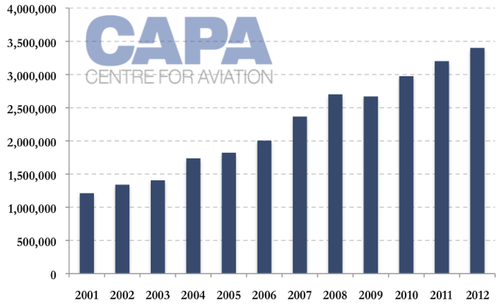 2012, despite being a challenging year for the airline, was much better, with a profit of JOD1.1 million (USD1.6 million). While this is the skinniest of net margins – just 0.14% on revenue of JOD802 million (USD1,132 million) – the carrier was proud the report the admittedly modest result, after a difficult couple of years for it, both financially and operationally. For 2012, the airline achieved an operating profit of JOD79.2 million (USD11.8 million), giving it an operating margin of 9.9%. While this may not match that of other privately held carriers in the region – such as Jazeera Airways with an operating margin of 29.6% and Air Arabia at 17.8% – it is still very healthy, given the generally low margins of the airline business, as well as the troubled regional situation. Traffic growth in 2012 was only 6%, increasing from 3.2 million to 3.4 million. Flying hours and the number of flights remained virtually static at 116,000 and 40,000 respectively. Passenger load factors crept up three percentage points to a still-low 73%, but, after several years of lacklustre load factors, the carrier has been making a concerted effort to ensure that it operates aircraft that are fuller, offering promotions and loyalty packages. The result is load factors that are their strongest in the last 10 years. Operationally, the airline continues to focus on cutting costs and increasing efficiency. In 2012, it managed to cut cost by around 1%, to JOD722.8 million (USD1,020 million), all while managing to increase passenger numbers and maintain its operational tempo. Unsurprisingly, the carrier’s largest single cost item is fuel. In 2011, fuel accounted for 42% of costs, a total of JOD292.7 million. In 2012 Royal Jordanian moved to cover some of the costs by hedging 31% of its fuel requirements through several contracts and introducing a fuel saving programme that cut approximately JOD10.3 million in fuel costs. However, the carrier’s fuel bill was still around JOD290 million, approximately 40% of its total costs. Chairman Nasser Lozi stressed that had the fuel prices not exceeded USD110 per barrel, its 2012 results would have been better. Part of the problem lies in the nature of Jordan’s energy market. 75% of the fuel supply is dominated by two state-owned companies. 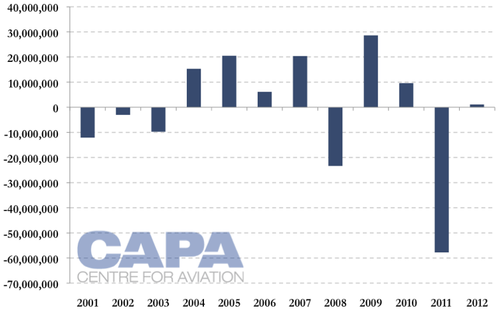 Despite the profitable net result in 2012, the year was scarcely any better for the airline in an operational sense. In the first quarter, the carrier cancelled nearly 500 flights due to regional unrest. More were cancelled in the second quarter. As in 2011, regional unrest played havoc with Royal Jordanian’s strategy of linking the Arab countries of the Levant – Jordan, Syria, Lebanon, Turkey and Egypt – with the rest of the world. As a response, Royal Jordanian announced it was cutting five routes and was considering downsizing its fleet. It also revealed its was considering a number of strategic options open to it, including a potential merger or a strategic partnership with another carrier. As the year progressed, the airline was also forced to suspend all of its services to Syria due to the security situation in the country. Despite the poor results of 2011 and the network rationalisation in early 2012, the carrier’s then CEO Hussein Dabbas announced that Royal Jordanian was “not shrinking” but was rather “consolidating” its operations. Mr Dabbas also commented that Royal Jordanians’ status as a national carrier would be difficult to maintain, given that it is stuck between two groups of “mega carriers”: the fast growing Middle Eastern sixth freedom players and the large European airline groups produced via the ongoing consolidation in the market. The carrier was “reviewing options” including talking with other airlines about a potential merger or a strategic alliance with the possibility of cross ownership, provided the Royal Jordanian brand could be maintained. The looked-for strategic agreement has not yet emerged. Instead, a management change occurred. Barely three weeks after his statement that a merger was a “must for the carrier”, it was announced that Mr Dabbas had resigned as CEO. He left the airline in Jun-2012, stating it was time for “introducing change and implementing new ideas" at the airline, despite only having been in the position since Aug-2009, succeeding Samar Majali, who moved to Gulf Air. Amer Hadidi was appointed as president and CEO at the beginning of Jul-2012. Mr Hadidi has been an advisor at the Jordanian court and head of economic and social affairs at the office of the Jordanian King, Abdullah II. Before that, he was Jordan’s minister of industry and trade, between 2007 and 2011. He also served as secretary general of the Jordanian Ministry of Transport between 2005 and 2007, where he was heavily involved with the privatisation of Amman International Airport, as well as the successful partial privatisation of Royal Jordanian itself in 2007, which left the Jordanian Government with a 26% share in the carrier, as well as the Jordanian Social Security Corporation’s holding of 9% and the Jordanian Army's 3%. When he joined the carrier one of his earliest moves was to assess the route network on a case by case basis, determining the contribution of each route to the overall network in terms of revenues and profitability. The strategy has seen a somewhat slimmed down Royal Jordanian adopt a new network strategy. Mr Hadidi has been unafraid to pull the carrier off loss-making routes, even long standing connections with other regional capitals, in favour of commercial agreements with other airlines. During 2012, Royal Jordanian suspended its operations to several European and Middle Eastern destinations, including Brussels, Bahrain, Muscat and Al Ain. It also cut back operations to a number of destinations, particularly in Europe. Frequencies to European capitals such as Rome, Vienna, Zurich, Geneva and Amsterdam were cut, as was capacity to Kuala Lumpur and Khartoum. To ensure that its coverage is not reduced, the carrier has replaced its own services with codeshares with a number of different partner airlines. Royal Jordanian suspended service to Bahrain, in favour of an expanded codeshare arrangement with Gulf Air. The Bahraini national carrier now offers twice daily morning and evening service between the two capitals and enjoys a monopoly on the route, following the demise of Bahrain Air earlier this year. The expanded relationship builds on an agreement the two airlines signed in 2004, allowing free sale of seats on both carriers’ flights between Amman and Manama. Royal Jordanian president and CEO Hussein Dabbas described the move as “in the best economic interest for both carriers and passengers from Jordan and Bahrain”, providing better flight timing and onward connectivity for passengers through Manama. 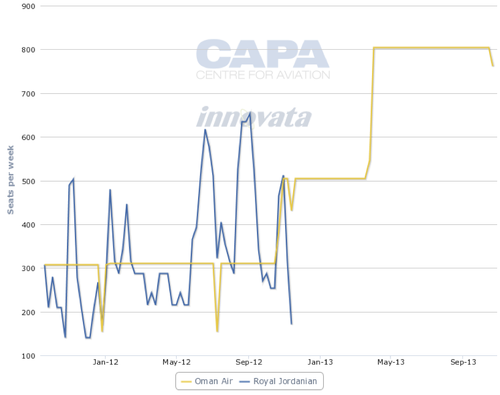 A codeshare agreement may also be coming with Oman Air. Late in 2012, Royal Jordanian ended its four-times weekly service to Muscat, a route that it had operated continuously for more than 40 years, citing commercial considerations. The carrier announced at the time that it was working with Oman Air on concluding an agreement to cover codeshare operations to Muscat. So far, no agreement has been forthcoming, and Muscat remains a gap in the carrier’s Middle Eastern network. On the reverse side of the ledger, Royal Jordanian also finalised a new free-sale codeshare agreement with SriLankan Airlines in 2012, covering Royal Jordanian’s operations between Amman and Colombo. The agreement is also the first stage in a potential full bilateral partnership between the two airlines, one which would also build on their future alliance partnership. SriLankan is a oneworld member designate and is due to become a full member of the alliance in Nov-2013. SriLankan Airlines is the carrier’s sixth oneworld alliance codeshare partner, after American Airlines, airberlin, British Airways, Iberia and S7 Airlines. Royal Jordanian has also proposed placing its ‘RJ’ code on flights by SriLankan Airlines flying beyond the carrier’s main hub at Colombo, after obtaining the necessary approvals and rights. The carrier stated that the expansion of the codeshare agreement into a more complete partnership “is bound to include more points in the SriLankan Airlines network”. Royal Jordanian and fellow oneworld member S7 Airlines, expanded the scope of their codeshare agreement to cover Moscow-Jeddah service, operating via Amman, in early Aug-2012. The route will make Royal Jordanian a key partner in handling pilgrimage traffic into Saudi Arabia from Russia. New routes could be on the radar as the airline's 787s arrive. Royal Jordanian is due to start taking deliveries of its first of the type in 2014, around four years after it was originally scheduled to take delivery of the aircraft. The carrier was the first in the Middle East to order the aircraft, but Qatar Airways beat it to the punch in introducing the aircraft into service. Eleven 787s will be inducted into its fleet by the end of 2017. The airline is due to take delivery of the 85th 787 off the production line. Boeing plans to deliver up to 65 787s this year, on top of the 49 it had already delivered to customers in 2011 and 2012, before the recent 100-day delivery halt due to the battery fire issue. Royal Jordanian intends to use the aircraft to phase out its older widebodies and access destinations that may have otherwise been marginal in terms of profitability. At the top of its list are routes in North America, including New York, Chicago, Detroit and Toronto. Qatar Airways – at present the only Middle Eastern carrier to have taken delivery of the 787 – has so far limited its 787s to routes around the Middle East and in Europe. Also in Royal Jordanian’s sights is Africa. The carrier launched service to Algiers on 25-Feb-2013, upping the route to three times weekly in Apr-2013. Mr Hadidi expects the route will serve business and tourism markets, particularly the medical tourism market. He also anticipates that it will feed other Royal Jordanian routes in the region, particularly Jeddah and Medina, when Algerian passengers will transit via Amman to conduct Umrah and Hajj in Saudi Arabia. According to an interview with Mr Hadidi in Jordan Business, Africa's market is “very promising with heavy demand from both pilgrims and business people”. The carrier’s next routes in the continent are likely to be in Nigeria and Kenya. Royal Jordanian reportedly plans to add Lagos and Accra routes from late Jun-2013, destinations that the airline had hoped to launch as early as 2011.